After my last post I thought Spring would gradually creep up on us and longer and warmer days were ahead. Hmm. The Quilters’ Guild had its ‘Spring’ Regional Day for our area on the Saturday the snow returned. The start of the day was not promising (unless you wanted a snow-filled day!) but most braved the early morning elements and, despite what looked like a blizzard outside most of the time, the roads were clear for our homeward journeys. We were amply rewarded with meeting many friends, patronising the traders and being treated to two excellent talks. 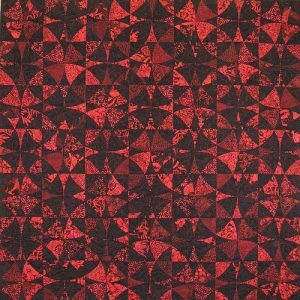 Heather Hasthorpe showed many of her stunning quilts whilst debating what constituted a Modern Quilt or a Contemporary Quilt. Generously she showcases many on her website here so do go and enjoy! I think my favourite was Red Dragons but there were several contenders. In the afternoon, with the snow still swirling outside, we were transported to a hot and dry Ghana by Pat Archibald’s account of her visit there, encountering many craftworkers. Weavers, dyers, basketmakers, bead makers – all working with the meagre resources available to them, recycling, repurposing and investing huge amounts of time and labour. One walked two or three hours to gather wood to fire his small kiln which he balanced on springs taken from dismembered car seats. Her lively and humorous talk gave much food for thought as I surveyed the abundance of ‘stuff’ in my workroom later. 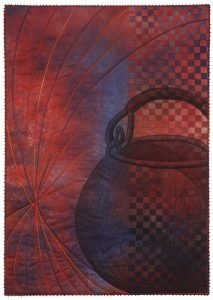 Pat has produced some stunning work based on her African experiences; you can see it on her website here. The blocks at the top of this post are waiting for me to decide what to do with them. Our textile group’s most recent challenge involved each of us being given a piece of a beautiful Nancy Crow fabric, to do whatever we wanted. It graded from light to dark, with a subtle range of greys and misty purples, and I immediately was seized with a desire to make small log cabin blocks (I have no idea where that came from!). In a way it’s wasteful of a precious fabric as so much is hidden in seam allowances, but I do just love the colour movement you can get with this technique. So I have eleven 3 1/2″ blocks to play with. Watch this space! 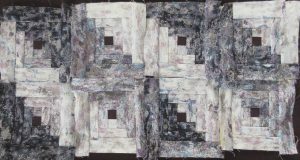 This entry was posted in Exhibitions and lectures, General, Patchwork and quilting by susanrhodes. Bookmark the permalink.